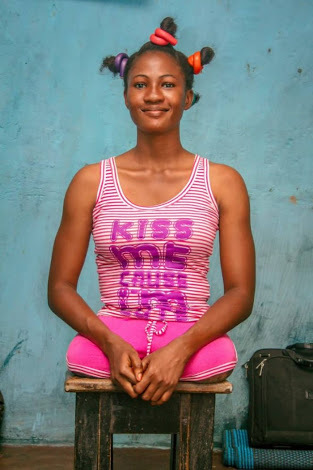 “As a toddler, Adenike’s legs began to rot away. At age 5, her two legs were amputated in order to save her life. 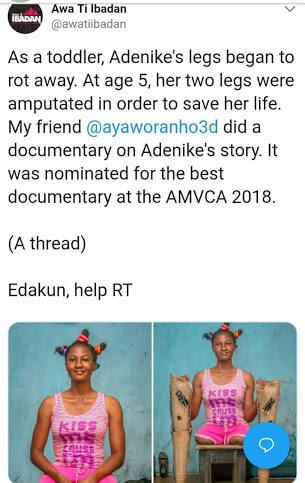 My friend @ayaworanho3d did a documentary on Adenike’s story. It was nominated for the best documentary at the AMVCA 2018. Despite her state and paucity of funds, she chose to go to school, believing her condition will not stop her from having an education. Today she’s a student of the Polytechnic of Ibadan. Adenike is a cheerful girl, always smiling and full of life, despite everything. Hey Buddy!, I found this information for you: "Story Of Beautiful Student Whose Legs Were Cut Off". Here is the website link: https://headlinenews365.com/story-of-beautiful-student-whose-legs-were-cut-off/. Thank you.